If you are looking for a timeless classic piece of furniture that has stood the test of time over hundreds of years, then you should look no further than here, through our web pages, where you will see the highest quality range of classic club chairs that are all offered at unbeatable prices. The club chair can be seen in many locations from the Historic gentleman's clubs of Westminster, to hundreds of embassies World wide, this is a classic piece of furniture which is seen in many situations the world over. Though there are many types of leather chair, the origin of the true club chair goes back to when it evolved from a single style of buttoned base, straight back chair, covered in leather and deep buttoned. Since these early times many variations of club chair are now available for you to choose from. Many styles are now offered, maybe placing a cushioned base on a standard frame, perhaps using different styles of legs, or button patterns to completely changing the shape of the frame giving a completely different style of club chair. 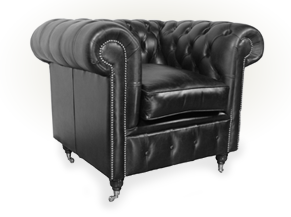 We at club-chairs.co.uk cannot tell you which types of leather club chair are best as this is entirely dependant on your personal preferences, the style or décor of the room into which this is to be placed, and the available space. You may be looking for a club chair which follows tradition and is finished in dark leather, it could be that you prefer a chair which has an overstuffed body and soft, hand stuffed cushion, if so then our Kendal club chair is right for you. Although leather is the number 1 choice, you might even want your club chair to be upholstered in velvet or other material, this is no problem because unlike a high street shop, we at club-chairs we really do manufacture all our club chairs to order, right here in our Yorkshire workshops, hand crafted by time served craftsmen, and you can be assured that no request is too obscure or difficult for them. All our club chairs are made on a solid foundation, just the same as a perfectly constructed building, so the frame is the key. We do not use inferior material because it is hidden, which is where many manufacturers save on money. At club-chairs we only use the highest grade, low knot count, kiln dried solid beech hardwood for our frames. We could save a few pounds by using soft wood such as pine or hardwood off-cuts, but by using this high quality hardwood, means that we can offer our 10 year frame and structure guarantee. Choosing which type of leather finish or colour is made easy for you and at club-chairs we offer three styles of finish as standard for your club chairs, Antique, Premium, and Hand Dyed. Our standard for club chairs is the Antique which is a durable, corrected grain leather hand antiqued after upholstery by partially 'rubbing-off' the darker coat on top to reveal a brighter traditional colour underneath, giving your club chair the look seen over the centuries. Premium leather offers a different look and is often preferred, perhaps when installed in a modern setting. This finish will show signs of creasing over periods of use giving a natural look with a colour variation over time, each chair having its own patina. Finally our hand dyed leather is buffed to give a very smooth finish and a really deep colour as well. There will be some "pull up� with this hand finished product and also some colour variance over time. There can be no doubt that this is the most exclusive of finishes for any club chair and is usually found on the more exuberant of models. We have the widest range of hand made club chairs on offer in distinctive leather finishes and with a wide range of colours from which you can choose. Add to this the nineteen models of club chair alone and we are certain that you will find that distinctive leather chair which is right for you.